Khenpo Namdrol was born in 1953 at Dege to Tsedrung and Choetso. At the age of seven, in 1959, he fled Tibet and reached Bylakuppe, South India. In 1968, he did Bum-Nga (the five hundred thousand accumulations of the preliminary practice). From Nyoshul Khenpo, a great Dzogchen Master, he received the teachings of the Thirty-Seven Practices of Bodhisattvas), Vishestava (Praise in Distinction to Buddha), and Mipham Rinpoche’s Tong Thun Sengei Ngaro (Notes on Tathagarbha entitled Roar of the Lion). Khenpo Khedrub taught him the Mipham’s Commentary to Abhidharmakosha, Commentary to Madyamakalankara, Condensed Tenet Concepts from the Treasury of Wish Fulfilling Gem, and Mipham Rinpoche’s Notes on Chandrakirti’s Madhyamakavatara. He also received the teachings on Mipham Rinpoche’s Notes on Nagarjuna’s Mulaprajna and other Madhyamika treatises. Later, he went to Sikkim for five years, where he received various teachings on Prajnaparamita, Madhyamika, Pramana and other sutra teachings from Khenpo Tsondrue. He also received Tantra teachings including Longchenpa’s Trilogy of Self-Liberation and Key to the Treasure – a general commentary to Guhyagarbha Tantra. At 25, according to the wishes of His Holiness Penor Rinpoche, along with Khenpo Tsondrue, he returned to Namdroling Monastery. In 1978, since the establishment of Ngagyur Nyingma Institute, he has been a key person in administering and teaching at the institute. In 1983, His Holiness Penor Rinpoche conferred the degree of a Khenpo on him. In 1988, he traveled to Serta, in Kham Province Tibet, to receive teachings from H.H. Khenpo Jigme Phuntsog Rinpoche. At that time he received instructions on the three different commentaries to Guhyagarbha Tantra: Mipham Rinpoche’s Osel Nyingpo (Clear Light Essence), Longchenpa’s Chogchu Munsel (Clearing the Darkness of Ten Directions), and Dodrubchen Tenpai Nyima’s Dzodkyi Demig (Key to the Treasure). Regarding Dzogchen Teachings, he received Chetsun Nyingthig (Innermost Spirituality of Chetsun), as well as Khenpo Jigme Phuntsog’s own instructions on Dzogchen, Liberation in the Palm of the Hand, Patrul Rinpoche’s commentary to Three Words that Strike the Vital Point, Pointing the Finger to the Nature of Mind and many others. Again in 1992, Khenpo Jigme Phuntsog bestowed him Longchenpa’s Treasury of Precious Meaning of Words, instructions on Khandro Nyingthig (Innermost Spirituality of Dakini) named Illuminating the Profound Path, Mipham Rinpoche’s Vital Instructions on Dzogchen Tekchod (Cutting Through) and many others esoteric teachings. Since the establishment of the institute, he has taught on various subjects including Chandrakirti’s Madhyamakavatara (Entering the Middle Way), Mipham Rinpoche’s Commentary to the Ninth Chapter of Bodhisattvacharyavatara called Ketaka, Mahayanasutralankara (Ornament of the Mahayana sutra), Mipham Rinpoche’s Nge She Dron Me (Lamp of Definite Understanding), Chidon Dzod Gyi Demig (General Commentary to Guhyagarbha Tantra called the Key to Treasure), Lochen Dharmashri’s Sangdag Gongyen (Ornament of Vajrapani’s Intentions – Commentary to Guhyagarbha Tantra) and many other distinct Nyingma Teachings and also many great works of Indian and Tibetan scholars. Hence, Khenpo has contributed greatly through his work in the administration and by teaching in the institute with only the single intention of the preservation of dharma in these degenerate times. In 1998, under the guidance of His Holiness Penor Rinpoche, Khenpo Namdrol established the Palyul Retreat Center, Samten Osel Ling in Pharping, Kathmandu Valley, Nepal. 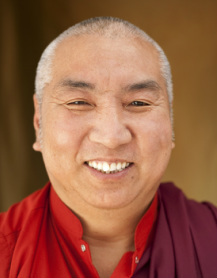 Khenpo now spends much of his time at this center, as well as teaching abroad and at the institute.